The last photographer portfolio in my excursion is taking us over to the land of the rising sun. 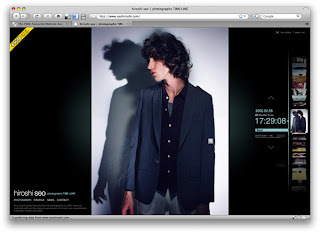 The site of Hiroshi Seo is packaged up neatly in concept, unlike the others we've seen so far. His work is presented as a simple story told over his career. 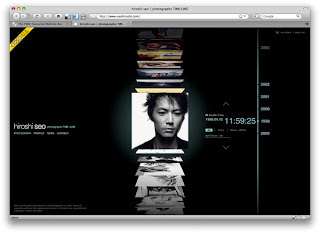 The timeline on the right acts as your guide through the tower of images that represent his body of work. In between the image tower and the timeline is an interesting touch that validates the concept. Here you'll find the timestamp of each photo in the tower. It's this minor detail that gives the site a sense of history and atmosphere (along with a bit o' music). Selecting a photo moves the timeline and tower over, always a better option than the a "close" button or the like. 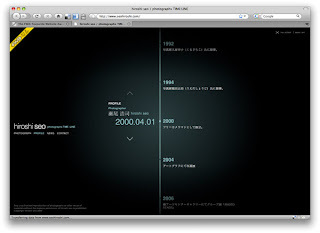 It's not often that meat-and-potatoes sections such as Profile or News would be included in a concept, but here the site carries through the timeline to support the content.